My India, My Canada is an absorbing memoir about a life divided between two countries—vast in their differences, but both loved. 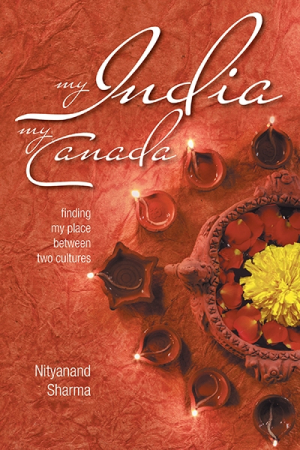 Nityanand Sharma’s memoir My India, My Canada recounts life divided between the Indian subcontinent and North America. Beginning with Sharma’s boyhood in rural India in the 1940s and ’50s, the text recalls a family life that stressed education and personal advancement. A series of successful school and work experiences gave rise to opportunities that led Sharma, as a young married father, to emigrate to Canada. Clear, straightforward writing introduces events in chronological order. Details create a strong sense of the time, place, and culture, and captivating scenes show what it’s like to be part of a large Hindu Brahmin family. In Sharma’s family, generations lived under one roof and children were trained to be obedient, respectful, and self-reliant. When attending school away from home, Sharma was expected to cook and care for himself; as a young adult, he accepted the bride his grandfather arranged for him, showing respect for and trust in his grandfather’s judgement. Such incidents underscore the book’s twin themes of personal success and family unity. Characters are defined through their actions and choices. Both Sharma and his wife, Kamla, show determination and make sacrifices that benefit their family. This includes seizing Sharma’s chance for advanced schooling and a job in Canada, though it means two years of separation. Adaptability is also revealed in small actions, as when Kamla manages to put together a meal of traditional Hindu dishes in Canada despite having found no spices and few vegetables that are familiar to her. The short book spans years and continents. Trips home to India, with children and mountains of gift-laden suitcases in tow, convey the joy of reunion. In Canada, Sharma’s curiosity and eagerness to know his new country bubble with insights. Snow is described with awed delight; lakes and pines prompt family vacations from coast to coast. The book also recounts the downsides of immigration: Kamla and her children wait two years before following Sharma to Canada, a difficult period spent living with relatives. Sharma is beset by requests from relatives who look on him as a source of funds, but finds himself ostracized when he can no longer meet their demands. Dozens of photographs underscore the book’s themes, first showing Sharma as a young boy with older family members in India, then as a father and grandfather surrounded by a family that’s growing and becoming more multicultural though marriage. Late in the book, Sharma and his wife embark on an extended religious pilgrimage to India. Here photographs take precedence over text, showing India as a country where gods and goddesses tower above roadsides in colorful tableaux and the Ganges spills from a source high in the western Himalayas. It is a perfect way to honor the long, successful marriage that began in India so many years ago.